The Allison J71 was a single spool turbojet engine, designed and built in the United States. It began development in 1948 as a much modified J35, originally designated J35-A-23. 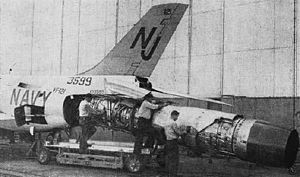 J71 engine change in progress on a F3H-2 Demon, 1963. 9,700 lbf (43.15 kN) thrust (14,000 lbf (62.28 kN) thrust with afterburner), for the McDonnell F3H-2 Demon. Afterburning turbojet engines for the Martin XP6M-1 Seamaster flying boat prototypes. Afterburning turbojet engines for the Martin YP6M-1 Seamaster pre-production flying boats. Wikimedia Commons has media related to Allison J71. ^ Gunston, Bill (1989). World Encyclopaedia of Aero Engines (2nd ed.). Cambridge, England: Patrick Stephens Limited. p. 11. ISBN 978-1-85260-163-8. ^ Wilkinson, Paul H. (1953). Aircraft engines of the World 1953 (11th ed.). London: Sir Isaac Pitman & Sons Ltd. pp. 64–65. ^ Wilkinson, Paul H. (1957). Aircraft engines of the World 1957 (15th ed.). London: Sir Isaac Pitman & Sons Ltd. pp. 74–75. "Aero Engines 1957". Flight and Aircraft Engineer. 72 (2531): 111–143. 26 July 1957. Retrieved 16 March 2019. "J71 Allison's Big Axial Turbojet". Flight and Aircraft Engineer. 67 (2418): 733. 27 May 1955. Retrieved 16 March 2019. "Allison J71 Turbojet". shanaberger.com. Archived from the original on 19 October 2006. Retrieved 16 March 2019. "J71 Allison, USA". www.leteckemotory.cz (in Czech). Prague. Retrieved 16 March 2019.